Hello Artistic pals!!! Time for a sale!!! Today I want to do a quick post on the Gelli Arts Gel Printing Plates!! All the girls on the Genuinely Jane Studios Design Team have been asked to write a post about one product that is carried in the GJS retail shop and I chose the Gelli Plate. I actually do not own one yet, but I just ordered one and it will be on it's way SOON. I CAN'T WAIT!!!!! 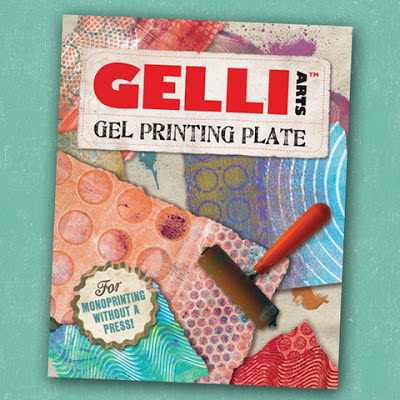 The Gelli Plates are one of the hottest and newest craft tools out right now. I have absolutely LOVED seeing the fabulous designs people have come up with. There are gobs of things that you can do with a Gelli Plate. The best spot I have found for ideas is the Gelli Arts blog. If you are excited like me about this HOT new product and want to purchase one, then you are in luck!!! Since I chose the Gelli Plate as my GJS product to feature today, you get a 30% discount form Genuinely Jane Studios. In fact, the entire Design Team has picked products to feature and Susan is giving you a discount on ALL of them. Watch the GJS blog for a full list of products that will be on sale and the Design Team member that will be featuring them on their blog.